This behaviour is very unnerving for me. I really don’t like seeing them argue. I know that it is important for them to learn how to negotiate different social situations but I also know that at this stage it would be very unrealistic for me to expect them to share. When they are older? Absolutely. But not now. Jack has been very interested in blocks lately. Unfortunately for him though, Sarah still finds much joy in knocking down blocks. This has caused a lot of frustration in our house recently. I think it is very important for Sarah to feel included; if Jack is building blocks then she wants to build blocks too. For her to be included and for the experience to be a harmonious one, Sarah needed her own space. I came across this little piece of timber when I was cleaning out the laundry, the perfect size for Sarah. Now she can play alongside her brother. What a difference a little piece of timber can make? A little space for them to each play. They played happily all morning. I have been reading your blog for several months and really enjoy it but I never quite pieced together that our kids are almost the exact same age. I have to admit that mine share quite nicely often, although I really think that is because my daughter tends to see herself in a rather maternal role towards my toddler (and has from the day he was born). Blocks are a constant problem, as are any type of arrange/set-up activity on the floor (we have a set of 1970s fisher price “Little Village” people which cause non-stop disputes because she neatly arranges them and he wants to bowl them over). One thing that helped us a bit was focusing on prioritizing. Either child can have something which is “special to me” that they don’t want to share, but they can’t stockpile toys or items. They get one thing which they don’t have to share in the moment. Obviously that item changes very frequently, but I think it allows them to combine a little bit of possessiveness/control with sharing. This is a big issue for my little guys. Just as soon as one of them is getting into the flow of an activity, the other one wants to take it, or move in on it. I’m looking forward to checking out the blog you referenced. In the mean time I do what I can in explaining how to share and play together, with little progress. Within the past month, Elliott has started trying to “trade” toys with Reese like Indian Jones switching the bag of sand for the gold figure. It’s pretty funny to watch, but it usually doesn’t get by Reese with any success. haha yeah Jack trades too 😀 Oh Sarah, you’re playing with that nice fire truck? …hmmm I’ll have that…here you can have this cup… She doesn’t think it’s too funny either. 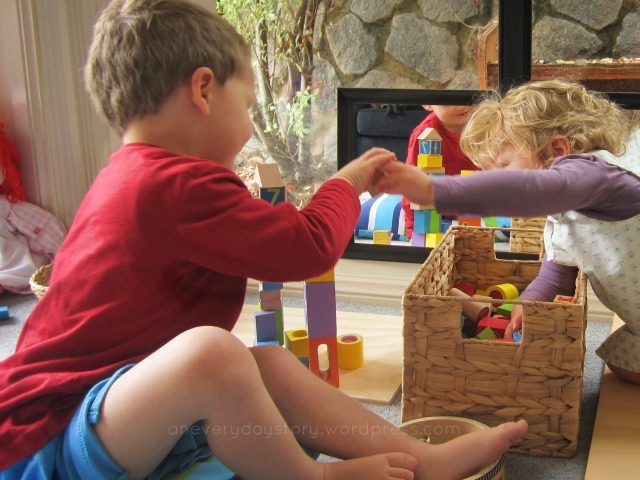 I have found that it is easier if they have something to share, like the blocks or animal figurines or whatever but then have a space of their own to play. This way they are sharing but are not in each others way. They aren’t at the stage yet where they will play together. With a 2 1/2 year old and another on the way I know I will be facing this issue in the not so distant future. What an inspired idea! It reminds me of a blog post I recently read by a Montessori mom about her child using a work mat that he unrolls to keep whatever activity he’s working on contained. When used in his classroom it also signals the other children to respect that little bit of private space. Of course for block building a piece of wood works far better as a surface than a woven or quilted mat. Still I think in many ways the principal is the same. I guess you are right Karen, just like a Montessori work mat. I hadn’t thought about it in that way. So as well as defining the area for keeping the materials tidy, it also gives them an area just of their own to work in. We’ll often say to Sarah (or Jack) ‘That’s Jack’s work.’ or ‘Jack is working there.’ It is easier now, they share the blocks but have their own work area. I love the coloured shape blocks – where are they from? I love your blog, I’m a long time reader! Hi Jane. Those blocks are just simple wooden blocks from Toys r Us. They were fairly inexpensive. 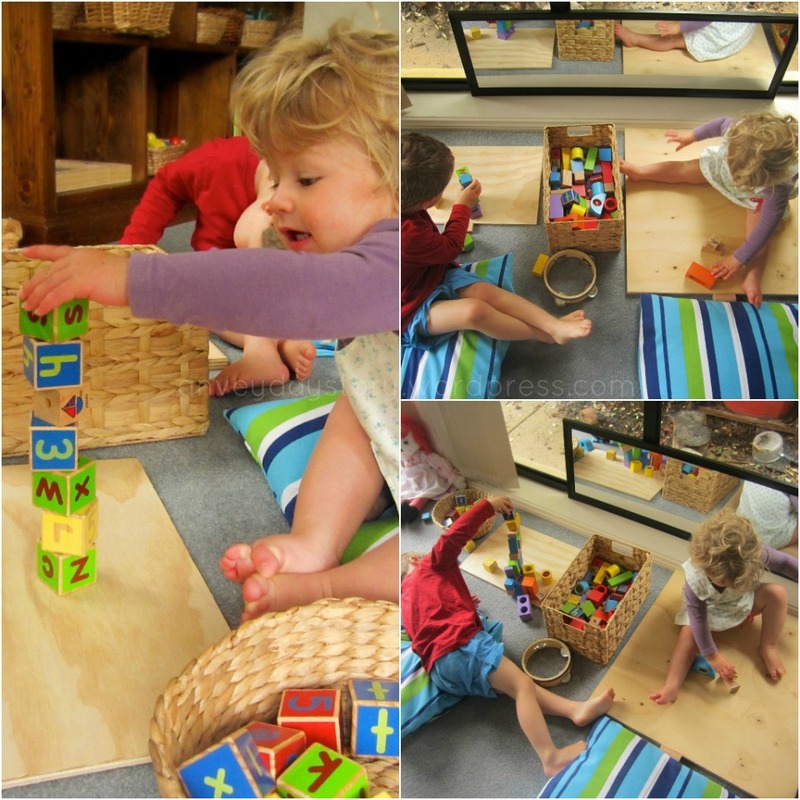 They came as a set with plain wooden blocks as well as coloured shaped ones. 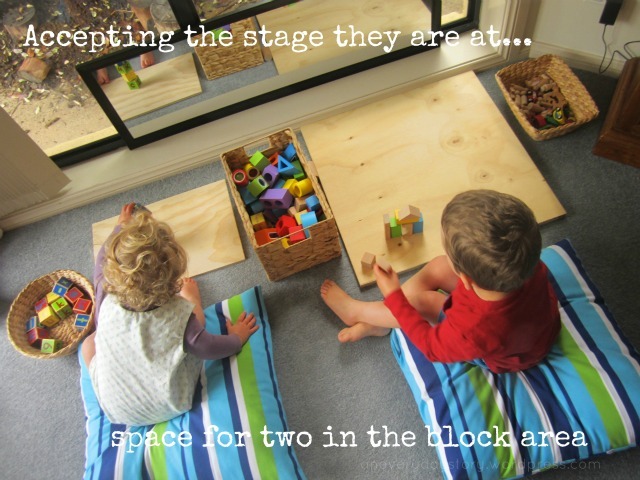 I love how you have the mirror in front of the block play area! Such a great idea. I really need to have more mirrors in our playroom. A really beautiful space! Today Otto was experiencing the same frustration as Jack with Sarah. Atlas kept coming along and knocking his towers down! Lucky for us, Grandpa is a hobbyist woodworker!